I love the flavors and colors of vegetables in the Summer! Just seeing all the fresh and brightly-colored vegetables at the farmer’s market makes me want to create beautiful recipes. Roasting red peppers with the sweet cherry tomatoes, brings out their creaminess and flavor in a different way than just sautéing them. It becomes a colorful painting on the plate, and even more memorable when you’ve taken your first bite. This dish is so easy and so sweet and delicious, I know you will be making it all Summer long, and it’s even vegan. 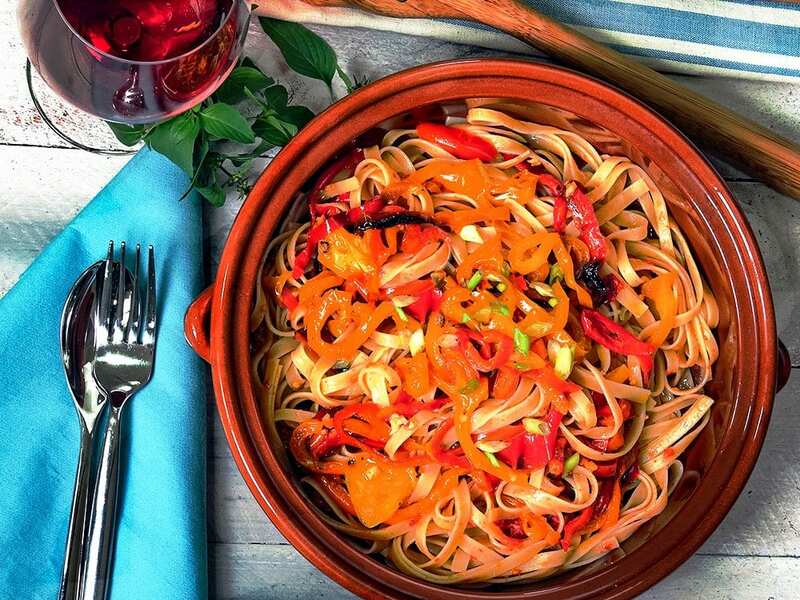 The recipe uses store bought fettuccine pasta, but if you feel adventurous and have enough time – don’t worry, it won’t be so time consuming – then you can even try to make fresh pasta using a pasta maker. 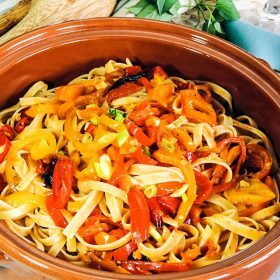 This summery recipe is easy to make and delicious, it combines a few different ingredients for an aromatic dish! 4 bell peppers 2red, 1yellow, 1orange cleaned and halved. With a kitchen knife halve the bell peppers. In a large shallow baking pan, put the the tomatoes and the halved bell pepper skin side up, drizzle with 2 tablespoons of extra-virgin olive oil, add 1 teaspoon of salt and some freshly ground pepper to taste. Transfer to the oven and roast them for 30 minutes or until the skin chars just a little and start to peel off. Transfer on a large dish and let them cool down. When cool, peel the skin off and julienne them. Collect all the tomatoes and set aside. (You don’t need to peel the tomatoes). Heat the mixed olive oils In a 12-inch skillet. Add the minced garlic and saute´ for 1 minute or less, do not burn it! 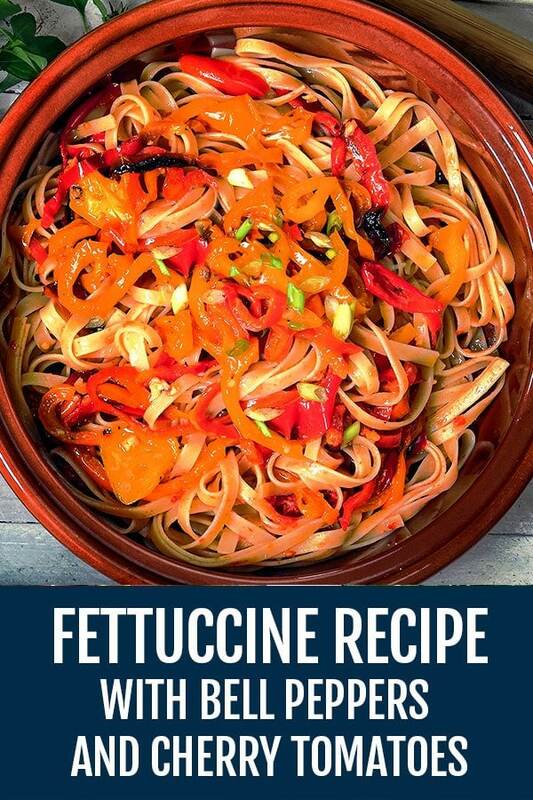 Add the bell peppers and tomatoes and stir to incorporate. Add salt and pepper, the chili flakes and the vegetable stock, bring to a simmer cover and reduce the heat to medium low. Cook for 10 minutes or until the liquid reduces to half. Turn off the heat and add the parsley. Drain and transfer immediately to the skillet with the sauce, toss vigorously with tongs to coat and add the rest of the Parmigiano-Reggiano.